Cal here in between auctions and flea markets. This is a fun time of year. 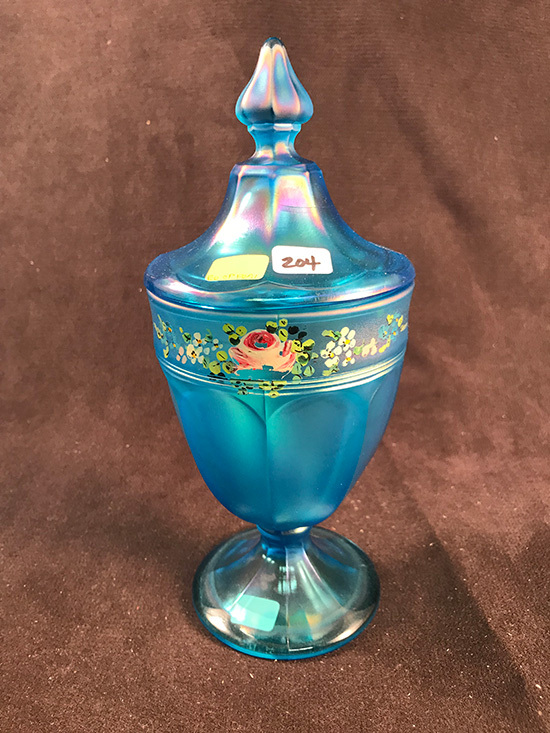 Many of the glass clubs are having their conventions and auctions, the outdoor flea markets are coming back to life here in the cold eastern states and there are more dealers at the local fleas as well. Household yard sales abound every weekend. Unfortunately, here in NC yard/house/garage sales produce very little of interest to serious glass collectors. I guess buying nice glass was not a priority here in NC in the early 20th C and as a result we don’t find much of it locally. 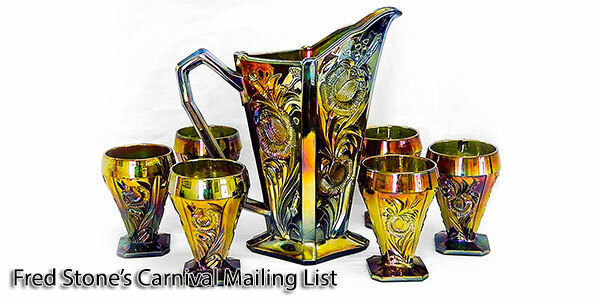 You have heard a bit about Randy Clark’s auction of Bill Crowl’s estate glass and souvenir china. Tonight I thought I would share a few of the acquisitions I made at that sale. 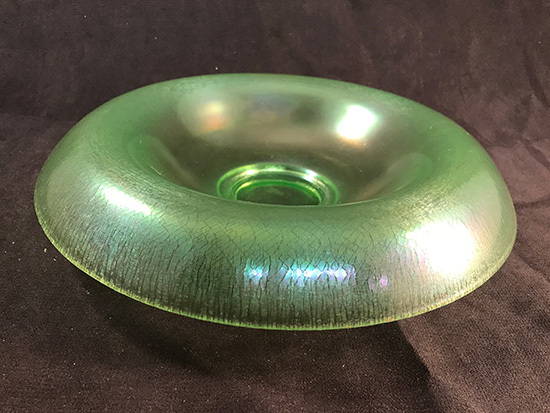 While most of Bill’s stretch glass was not found when Randy cleaned out his house and garage, some unusual pieces did manage to show up in the auction. 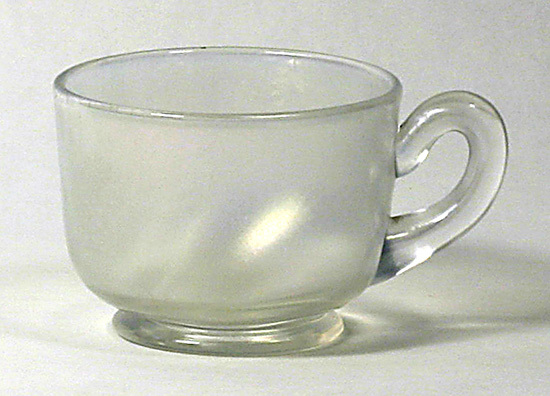 First up is a Persian Pearl Fenton punch cup which was hiding in a box lot of Topaz stretch glass. I certainly wouldn’t have expected it to be in a box lot, but it was there and I was lucky enough to 1) spot it and 2) win the box lot. 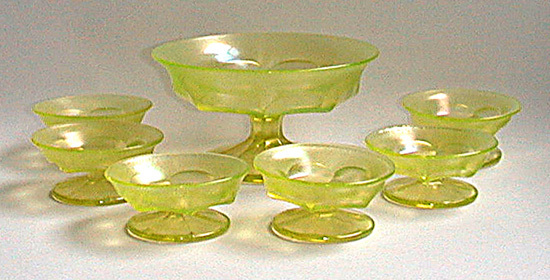 Fenton punch cups are known in Celeste Blue, Florentine Green, Persian Pearl, Grecian Gold/Marigold and Ruby. There are enough Celeste Blue ones to make at least one available to most collectors who would like one. There are a few less of the Florentine Green ones, but still enough so that neither of these colors is considered rare at this point – hard to find, maybe, but not rare. 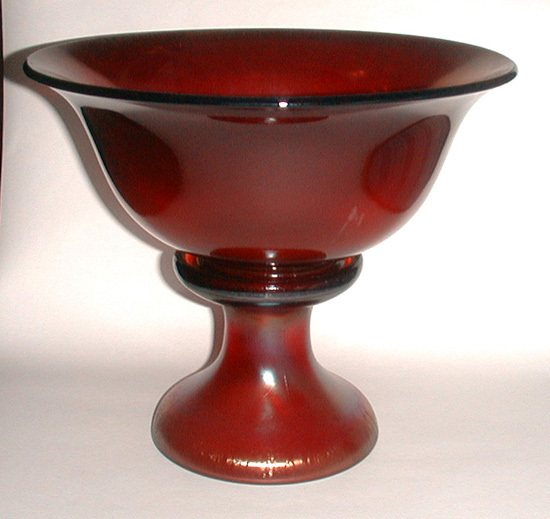 To my knowledge there is only 1 Ruby Fenton stretch glass punch cup from the early stretch period known. Of course there must have been more than one made, so maybe we will find some more in the future. I believe the same may be true for the Grecian Gold punch cup. I am only aware of one; again, it seems like there would have been more than 1 made and so there may be others of which I am not aware. Persian Pearl punch cups are known; in what quantity they exist I am not aware, although I do believe there is at least one set of them and a few individual ones known. A full set of punch cups would be 12; I’m not sure if the known set has 12 or some number less than that. At any rate, there is one more Persian Pearl punch cup ‘known’ now. By the way, there was a Celeste Blue punch cup in another box lot! Another small item which appeared in this auction was a Russet Northwood nut cup. Northwood made a master nut and individual nut cups. My understanding is that 1 master and 6 individual cups comprised a full set. I don’t believe I have ever seen an original advertisement for them, so I cant say for certainty that this is the case, but this is the way they are collected today. I am aware of the master nut and individual nut cup being known in Blue, Topaz, Marigold and Russet. 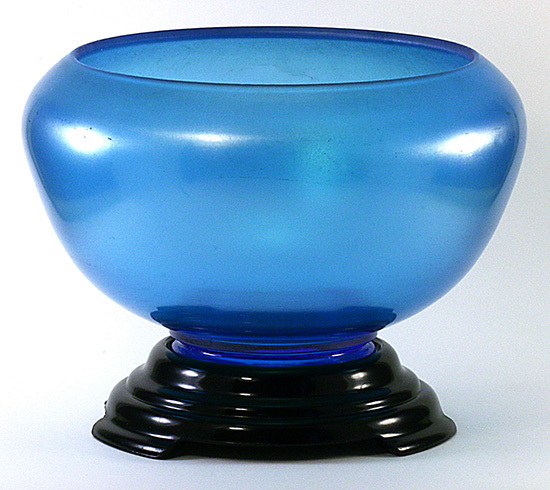 Northwood made other colors of stretch glass (Light Opaque Blue, Custard, Royal Purple, Emerald Green, Crystal and White Opaque) but I am not aware of the nut pieces showing up in any of those colors. The Russet master nut is quite rare; I am fortunate to have one; I’m not sure how many others exist. The Russet individual nut cup is equally hard to find, although I am aware of more than one of them being in collections. Randy had the individual nut cup in a lot with some other Russet stretch glass. It was in the catalogued part of the auction. Fortunately for me, no one else seemed to be interested in Russet stretch glass at the auction, so I was able to buy the entire lot for a very reasonable price and acquire my 2nd individual nut cup. One more individual nut cup and I will be more than half way to a full set. If you see one or more and don’t want them for yourself, please think of me as I would very much like to complete my set in Russet. Jumping from the small to the large items, there were two 15+” Imperial Ruby Salvers. These are monsters – maybe there were intended to be underplates for some of Imperial’s largest bowls or just very large plates. Either way, they are wonderful (although impossible to display in any normal display cabinet). Another very large item which showed up in the auction is a Fenton #604 special rolled rim bowl. We most often see the #604 mold being finished as the punch bowl. Fenton, however, used #604 to produce several shapes of bowls, all of which are quite large. 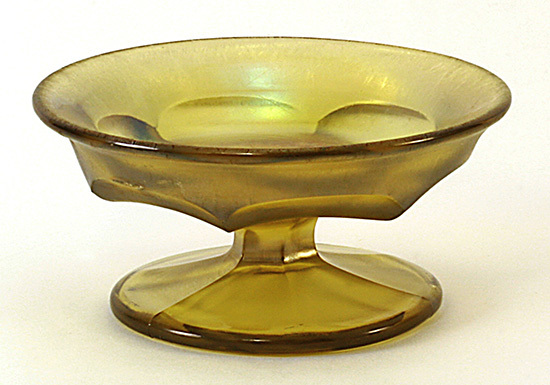 After the punch bowl, the most common shape is the wide flared, cupped aka ‘ice cream bowl’ shape. Less common, but available is the #604 aquarium shaped bowl. 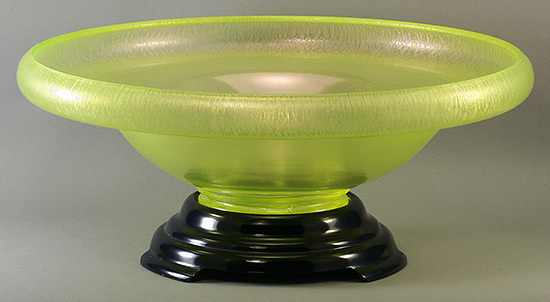 There is also a #604 flared bowl with a rolled edge, not rolled all the way down as is the case with the special rolled edge, but still an attractive bowl. And then once in a while Fenton would flatten the #604 bowl into a plate. The plates are also very large and beautiful. These #604 items are known in Ruby, Wisteria, Celeste Blue, Topaz, Persian Pearl and Florentine Green. Not all shapes are known in all colors but as time goes on, we are finding more shapes in colors previously not known. 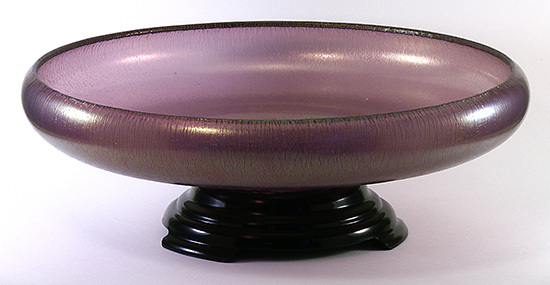 A few years ago I purchased the same special rolled rim #604 bowl in Topaz. I suspect it and the Florentine Green one are at least hard to find, if not rare. 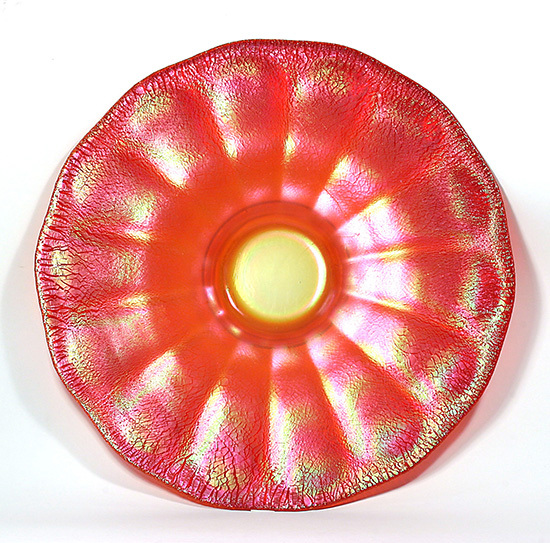 There was also a #604 ruby plate sold in the auction as well. From talking to the new owner, I learned he had previously owned the plate and sold it to another collector. Bill bought the plate at the other collector’s estate auction and now the original owner purchased the plate at Bill’s estate auction. This seems to be a reminder that “matter is neither created nor destroyed….” and reminds us that we are only the caretakers of all the beautiful glass we collect because some day it will move on to someone else. One last item which I found interesting was a Blue Diamond candy jar with flowers painted on it. I’ve not see Diamond candy jars with decoration on them. Whether this was done at the Diamond factory, by an after-market decorator or by a talented artist-owner we will never know. It’s pretty and different and now has a place in my collection.